If you're a good beer geek -- in the U.S., anyway -- you are always on the lookout for beer "on cask". You hope for a more flavorful experience: warmer, flatter beer that the bartender has to laboriously pump into your glass with the big porcelain handle mounted on the bar. Two recent internet articles have me pondering the state of cask beer. One is by Ted Sobel -- the brewer/publican of Brewers Union Local 180, an all-cask-ale brewery in remote Oakridge, Oregon -- explaining on his blog why he won't let the beer he brews out of his sight. Shortly after Ted's post, Beer Advocate asked its readers for their opinion on this question: (paraphrasing) is cask beer done right in the U.S., or are those pumps just a gimmick? In Great Britain, the Campaign for Real Ale (CAMRA) promotes this particularly English way of producing and serving beer. There's special emphasis placed on the condition of the beer: the publican has to cellar it while it finishes fermenting, then let it settle after he jostles it up to the serving area, then make sure it is served at the right temperature, while it's still fresh. The contents of the kegs are dubiously named cask-conditioned beer, which in many cases simply contain ale destined for keg that has been drawn off from the fermenter and primed in the cask (keg). Now, to my mind, that's good enough. It would not be good enough if it were just an ordinary keg of beer, not re-fermented in the keg. But if the keg is conditioned, it's legit, right? We currently have three engines pulling from firkins at both our brewpub on NW Marshall St and the Alehouse on SE Hawthorne. Our cask ales are my beer of choice when I go down at the end of the day to our pub for my pint. And yes we have the stillage racks, spiles, keystones, cask breathers, etc. And Bridgeport's cask ales are definitely a treat. What places in Portland serve cask ale correctly? What places in town are faking us out? What places have cask ale, but in poor condition? Can "ale destined for keg" qualify as cask-conditioned? What about Beer Advocate's question: is cask just a gimmick? Can't answer your Portland specific questions, but I have found cask beers, in general, to be muted when compared to their non-cask beers. I did have one cask beer (Ballast Point's Sculpin IPA) this fall that flipped this thought on its head. Plenty of gimmicks, but brewers that take it serious make the cask experience worth while. I don't have much of an opinion on the arcana of what qualifies as a true cask. I do love a nice cask-conditioned ale, prefereably a low-to-moderately hopped and strength beer. More than that and you lose the principle advantage of cask-conditioning--the ability to perceive subtlety. I will say that I hate those things that turn cask ales into quasi-nitro pours. Terrible. While I am guilty as charged for always looking out for cask-ale, I have been disappointed on more than one occasion. Unless I frequent the pub often, I usually try to chat up the server or bartender and get an idea about how they treat their casks. That being said, there are certain organizations in the States dedicated to educating U.S. beer-lovers about the delicate but delicious casks. CASC is a group of enthusiasts that set up the annual New England Real Ale Exhibition. I’ve only attended one NERAX event but after sipping a few milds, bitters and other ales on cask I’ve been hooked ever since. The CASC folks ship their casks in from England and a good number of American breweries contribute their brews for the cask treatment. I learned a lot from the folks running that festival. After tasting a few neglected casks brews since my NERAX experience, cask beer is definitely NOT a gimmick. When it’s given the attention it deserves and is handled with skill, cask ale reaches a level nothing else can replicate. Unfortunately, when pubs don’t take the effort to take care of the beer it winds up fitting the cask stereotype: flat and warm. I agree with you gents that cask beer can be fabulous. I hope to hear which pubs are doing it well, and who's doing it poorly or even cheating. @Jeff: sparklers? I thought everyone in our area used those on their engines. Even Brewers Union does. Hm. Before reading the comments I would've said that cask ale is a gimmick but I see that clearly I will have to reconsider that assessment. Maybe it just never was served to me properly. I'll have to stay on the lookout. * What places in Portland serve cask ale correctly? This leads to the question, is it about the beer kegging/casking at the brewery or having a proper cellar master who knows how to mature and condition the casked beer to maturity at the pub? I believe Ted is doing it all at his pub, but is very leery that the average pub doesn't know how to properly condition a REAL cask. He probably has right to worry. Karl mentions all the correct Conditioning equipment, but does that mean their casks are conditioned at the brewery and sent out at their prime or is Bridgeport INSTRUCTING people at the pubs on how to properly condition a cask? The answer is quite complicated and depends on the breweries product and the conditioning experience of the pubs. * What places in town are faking us out? See above. If someone was to able to look at the keg/cask that's on the beer engine, they could look for tell-tale signs of proper casking. A usable bung with spiles, cask breathers and the like. The cask should NOT be fed with any CO2. The beer engine displaces beer with outside air into the cask. A tapped cask ale does have a long life span once tapped. * Can "ale destined for keg" qualify as cask-conditioned? Usually casked beers finish fermentation in the cask not in the fermenter. So, the answer would be NO. * What about Beer Advocate's question: is cask just a gimmick? I'm sure there is a gimmick factor at some (many?) pubs, but a truly cask condition beer is no gimmick. Specific to Portland, the Moon and Six always seems to have excellent cask beer, as does Deschutes (despite the douchey customer base who have no idea what the term means). I've also had good luck at County Cork. I'd like to say the Horse Brass is good, but they're hit or miss in my book. As for bad, I've had several cask beers at New Old Lompoc on 23rd that were undrinkable (most recently, a C-Note that tasted like bitter dish water). You beat me to it, Bill. I had a formal response to your comment on my post on its way, but now I'll wedge it in here. Of the many goals of this pub and brewery, several relate to your story. 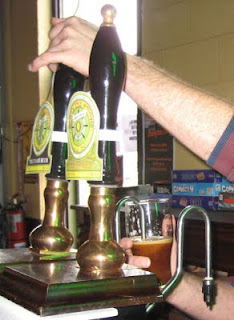 A primary goal here is to replicate the British traditions, in contrast to using what might be considered "modern" techniques (as in Whurst's comment) or variations on how beer might be consigned to a vessel of any description whatsoever and served by gravity or a handpull. A second goal was to fiddle with the recipes such that they break out of what some in the UK consider to be a stale mold. Consider this to be a marriage of traditional techniques with modern, and particularly West Coast, recipes. Thirdly, I'd like to see more real ale, and real ale pubs of the classic Mom-and-Pop persuasion. Kudos to Block 15 in Corvallis for heading in this direction. Re: drawing keg-destined beer off into a cask; I'm finding here that recipes need to be adjusted depending on which path they are going to follow, especially as the alcohol and hop content increase. That nice, overly-hopped West Coast IPA, ABV 7.3%, is nice at 34 degrees, but tastes like rubber at cellar temperature. When I've had the time and cash to head out, I've written about my searches for what I consider to be true real ale in my blog. I hope to do more of this as my elusive pursuit of time and cash permit, and welcome discussion with anyone on the topic. For the record, I believe Deschuttes in Portland does the best job that I've found so far, although the snob in me questions their use of a cask breather over a microfilter and non-return valve combination. @Ted: thanks for sounding off here. I think I get your point now: a recipe that's good for kegged/bottled beer might not be good for cask-conditioned ale. Sounds reasonable. Personally I think Bridgeport's IPA and ESB are real-ale recipes that shine from a cask, are almost as good from a keg, and suffer in a bottle. @MT: That's what I was looking for! Thanks for naming some names. Right on about Deschutes: fresh-hopped Mirror Pond from the cask is a beer I will remember forever. @Anonymous: Excellent points. I did ask Karl whether Bridgeport's cask offerings are handled properly (your point about instructing pub staff). He didn't directly answer, but what can he say, he's not going to say "No, we don't handle them properly". ;-} I guarantee that the Bridgeport mothership in the Pearl is handling them correctly.